You know... we say that we wanted two boys, but in reality, we wanted a little girl- so instead of dressing Zac like the little boy he is, we occasionally put him in girl clothes... it makes us feel better. Thank goodness for friends who have girls... we can just borrow their clothes instead of having to go out and buy our own. 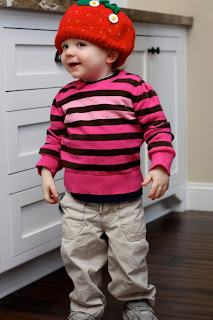 Last week, I let Phoenix pick what hat he wanted to wear to daycare... and... of course... he picked my maroon, fuzzy one - it was adorable on him! And, all of the teachers loved it!